Back in June, I posted a life update in which I said I had laid down some roles to allow myself some time and energy to focus on some other things I had planned, coming up. One of the things I gave up was being Project Support Officer for Women Aloud NI and one of the things I intended to start was an A Level to prepare myself for starting a degree. About a month after that, I published another blog post about how great it has been having room to think and write with fewer things distracting me. On both these counts, I have further news. 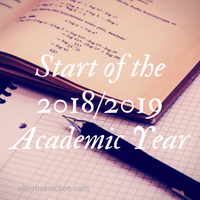 Without rehashing the long conversations about the pros and cons of studying, I will cut to the chase and just say that – for now – I’ve put that idea on the back burner and will not be taking a course this year. This is actually the first academic year in which I’m not studying anything. It feels… weird, I guess. I mean, even when I dropped out of university and moved back to Northern Ireland for a year before I ended up in Oxford, I took some classes at Crescent Arts Centre. Then, while I was working in Oxford, I was also taking a course in Youth Work. Back at home again after that, I was back at the Crescent Arts Centre learning things there and doing a few other things on the side. Weirdness aside, I’m confident the break from studying will not be a break from learning and that it is the right decision for me right now. I mean, I have such a good thing going at the minute in terms of my writing and mental health, why risk burning out again by taking a course I don’t *actually* need to take? If things change again – which they may well do – I can sign up for something in January and that’ll be okay. The main thing is that I’m not stressing out about it. Healthwise, I’m doing okay in general which is also a big plus. I am feeling excited for the next twelve months and whatever they bring.